Getting your hands on your favorite podcasts just got easier with Tuesday’s release of iTunes 4.9. The latest version of Apple’s music jukebox and download application adds support for podcasting, a new type of time-shifted amateur radio. 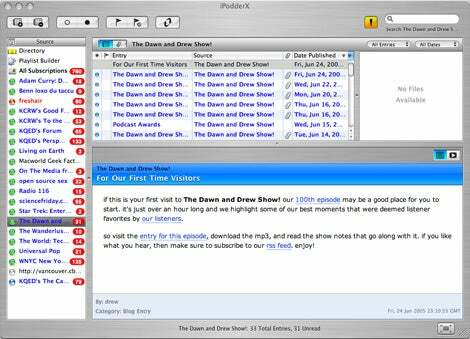 Up until iTunes 4.9’s release, podcasts typically have been downloaded through a podcasting client, such as iPodder or iPodderX. Now, iTunes and podcasting are one, completing a seemingly inevitable union. Here’s what you can expect when searching for podcasts in iTunes. From the time you launch the Version 4.9 update, you’ll notice that this isn’t your parents’ iTunes. For starters, the application now features a Podcasts icon wedged between the Library and Radio icons in the left-hand side Source Pane. Much like the Purchased Music section that houses all your downloads from the iTunes Music Store, the Podcasts area lists all the podcasts you’ve subscribed to, along with their time, release date, and description. It’s in this area where you can adjust your podcast preferences—how often you check for new episodes, which ones to download, and how many episodes to keep. For example, you can check for new podcasts every hour, every day, every week or manually. You can also set iTunes to download all episodes or only the most recent one (or to do nothing when new episodes are available). You can keep all unplayed episodes (which deletes the podcasts you’ve listened to), the most recent episodes, a set number of episodes, or all of your podcasts. 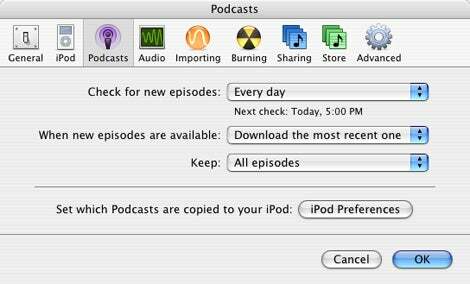 There's also a button for setting which podcasts are copied to your iPod. You access the podcast preferences through a Settings button in the bottom right-hand corner of the Podcasts section or via iTunes 4.9’s Preferences. What about the iTunes Music Store itself? Click there, and you’ll see a banner a the top of the Store announcing that “Podcasts are here.” That banner takes you to the new Podcasts directory, which looks exactly like the rest of the iTunes Music Store Interface. A major difference with the Podcasts page from the rest of the iTunes Music Store is that the Buy button has been replaced with a Subscribe button. (Even though podcasts now dwell in the land of 99-cent music downloads, you can download them for free.) The Podcasts page is also accessible through the Music Store’s menu; there’s a link in the main menu on the left-hand side just above the Audiobooks and iMix links. If you want to sample podcasts before you subscribe to them, just click on the title of the podcast much like you would click on an iTunes Music Store song title to hear a 30-second snippet. The difference here: you’ll hear a stream of the entire podcast episode. It’s worth noting that iTunes users who don’t upgrade to version 4.9 can still access the Store’s Podcasts page and browse for podcasts. You can even stream some of the podcasts by clicking on their title (although we had mixed success doing this in iTunes 4.8—some titles streamed, others did not). 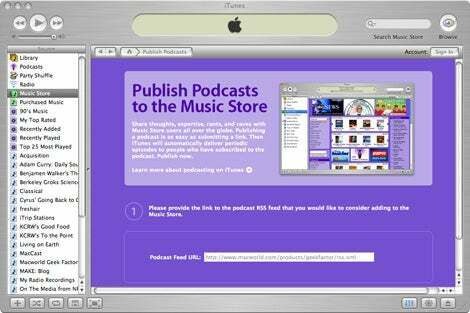 However, to download, subscribe, manage, or submit podcasts, you need to install iTunes 4.9. Apple has broken down its podcast offerings into categories—everything from Arts & Entertainment to Travel. There are also podcast-specific categories such as Audio Blogs, Public Radio, and Talk Radio. Clicking on one of these categories produces the three-pane view of Genre/Category/Subcategories that will be familiar to anyone who’s spent any amount of time browsing other sections of the iTunes Music Store. In addition to listing the podcast by name, the iTunes Music Store also shows the time, artist, album, and genre followed by a subscribe button. Click on the arrow next to the album name, and you jump to a page showing all the podcasts from a particular artist. This page replaces the album and genre fields with release date and description data; a clickable “I” icon in the narrow description field provides the full text for a particular podcast. So how does iTunes 4.9 stack up against some of the other podcasting clients? Well, having used iPodderX, I’d say it is an improvement, if for no other reason than it eliminates the need for another application. 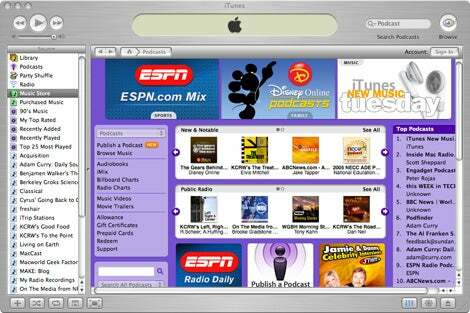 In iPodderX, you had to select which podcasts to subscribe to; when the client updated new podcasts, it would open iTunes to transfer them from your Mac to your iPod. iPodderX works well, but it has a very cluttered interface, with four windows across the single application, displaying podcast lists, the list of files to download, the selected file name and a large window for show notes. Apple’s effort simplifies the interface, though it could take a page from iPodderX’s playbook and incorporate the show notes directly in iTunes. (Currently, you have to jump to a podcast’s Web page to find the show notes.) The only information of a particular podcast that you get is just the name, the date, and maybe a hint in the description field. Integrating podcasts into iTunes makes getting podcasts easier by eliminating the need for a third-party application. Also, iTunes lets your preview (or even listen to the whole show) before you choose to subscribe to a particular podcast—a feature iPodderX doesn’t offer. However, Apple also managed to link to smaller and newer podcasts as well, like the official podcast for the recently completed television show Star Trek: Enterprise to my own podcast The Wanderlust Geek, and even to my friend David Boyk’s Universal Pop podcast. If you’re new to podcasts, you should check out Curry’s Podfinder Podcast. Sometimes affectionately known as the “Podfather,” Curry is one of the early podcasters and developers for the podcasting client software. His Podfinder show serves as the iTunes Weekly Podcast Guide, with Curry guiding you through what’s out there with his usual charisma and charm. Click continue—you’ll be prompted for your Apple ID. Once that’s entered, iTunes will cull your RSS feed for information about the author and the description of the podcast that it will automatically enter. You can also select a category for the podcast to be filed under. Then click Publish. You’ll then see the last screen, which reads, “Thank you for publishing this podcast to the Music Store.” It was one of the first things I did when I fired up iTunes 4.9 at around 10 a.m. Eastern on Tuesday; as of press time, however, the file I uploaded had not been added to the iTunes directory. Getting a podcast up on the iTunes Music Store is a big deal for podcasters because they get great exposure. However, iTunes users aren’t barred from adding podcasts not linked-to by Apple. To add any podcast, choose Subscribe to Podcast from iTunes 4.9’s Advanced menu and enter the podcast’s URL in the resulting window. Currently one of the biggest podcast directories is Podcast Alley. It might be nice to see a link to that site if Apple winds up lagging on updates of new podcasts. My initial tinkering with iTunes’ podcast features turned up a few problems with some of my favorite podcasts. I subscribed to The Daily Source Code and tried a download, but I kept getting an error message: “The network connection was reset.” This was also true for The Dawn and Drew Show—both it and The Daily Source were unavailable as either a download or a stream. There’s also a minor problem of redundancy. A search for “Curry” in the podcast directory turns up the Podfinder, The Daily Source Code, two editions of Adam Curry’s weblog, and two editions of iPodder news, also by Adam Curry. A little housekeeping would seem to be in order. In addition to Tuesday’s iTunes update, Apple quietly released a new program called Chapter Tool. Even though it’s still in beta, it’s a neat little Terminal application that is available as a free download through the iTunes Music Store. 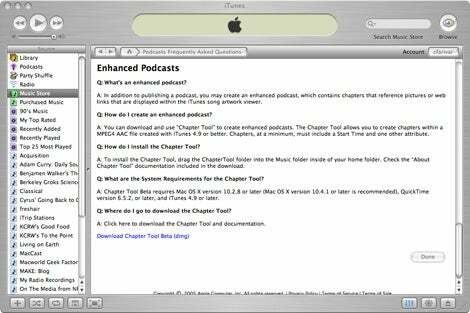 Chapter Tool allows you to turn your podcasts into &#8220e;hanced podcasts” that allow you to create chapters within an MPEG4 AAC file created by iTunes. Under the Podcasts screen, click Publish A Podcast and then click Learn more about Podcasting on iTunes. Scroll all the way to the bottom and click Download Chapter Tool Beta (dmg)—it’s the blue line in the screenshot below. Be advised, Chapter Tool runs only in the Terminal and requires familiarity with the command line. If you’re comfortable in that environment, then have at it.